This is one of the more worrying cases that we have attended. We were asked to investigate what the householder thought was a faulty inverter, as his solar yields were down by half. An electrical test quickly revealed that there was no output from one of the two solar PV strings. Further investigation led to the discovery of some MC4 connections in the loft that had overheated, melted and scorched the adjacent roof truss. 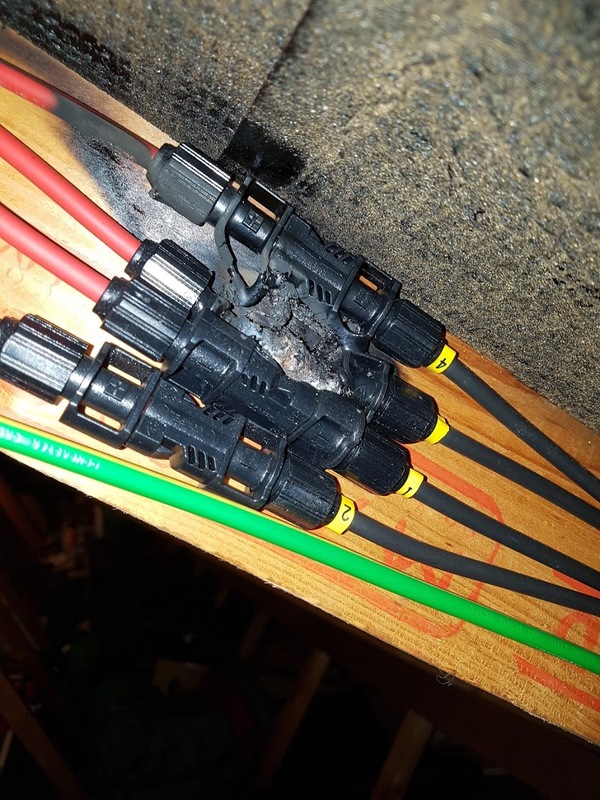 Upon dismantling the connectors we could see that they had not been fitted with an MC4 crimp tool, and instead had been squeezed together, probably with a pair of pliers because the installer did not want to buy the correct tool. The sustained d.c. current from the solar panels caused the badly fitted connectors to heat up and cause the damage in the photograph. Had the connection not eventually burnt itself out, there would have been a very real danger of a fire. We replaced all of the installer-fitted connectors, including those underneath the panels. Perhaps some installers do not appreciate the risks involved with this type of deliberate short-cut, but we come across this type of thing week in week out. We were recently called out to Whittle le Woods Village Hall to a system that was originally fitted by Solar King in 2011. The concern was that the solar panels were not generating anything. 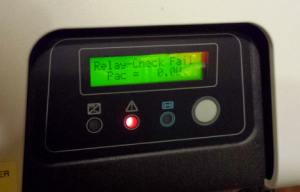 The inverter was displaying an isolation error which means that there was an earth leakage fault on the solar array. An electrical test at the inverter terminals confirmed this. Isolation faults are almost always due to badly fitted connectors. We isolated the array and got onto the roof to investigate. We quickly found several problems with the installation. There was a missing clip, meaning that one of the solar panels was not fastened down properly. 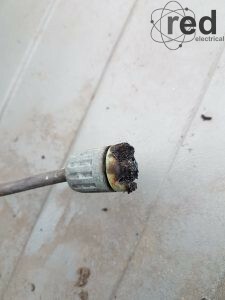 Even more concerning however were some of the connectors that the installers had fitted onto the d.c. cables, which were not fitted correctly and therefore were allowing water ingress. The connector to the right had corroded and caused a d.c. arc fire. This had burned so hot that it melted a hole in the metal roof covering. Luckily this had extinguished; had there been a build-up of leaves, the fire could have took hold. Another connector had a crack in it which could have resulted in corrosion with similar results. 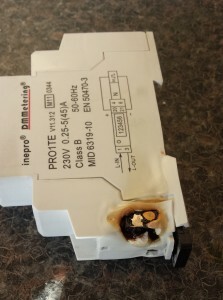 If your inverter complains of an isolation error then you should immediately switch off your inverter and contact us; just because the connections are outside does not mean that they can’t cause harm. We were recently called out to investigate a solar PV system not working in Burscough. Unfortunately, the original installer had long since closed their doors. An inspection of the system revealed a serious defect – due to a badly made connection, there had been some electrical arcing at the generation meter, resulting in the casing of the generation meter melting due to the high temperature. This poor electrical installation work by the original electrician could have resulted in a fire. We replaced the meter with a new one, making sure the connections were tight of course! We were called out to investigate a system that had provided good yields for three years, but the client had noticed a recent drop in the yield of around 30%. A quick test of the solar panels showed a marked reduction in performance. Some panels were more affected than others, but all twelve were underperforming. The likelihood of a solar panel developing a fault is extremely low, so for twelve panels to do so meant that there had to have been some event. We suspected lightning damage, but this of course is difficult to prove. 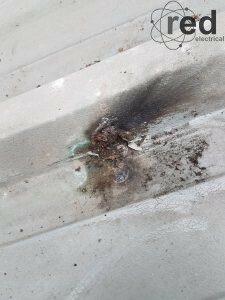 A direct lightning strike would have destroyed the house, but a cloud to cloud strike, which occurs more frequently, can damage electrical equipment including television equipment, telephones and solar panel installations. We therefore interrogated the inverter for anything out of the ordinary. The inverter had recorded an unusual fault on 20 October 2013, and had consistently recorded low d.c. voltages from the solar panels ever since. 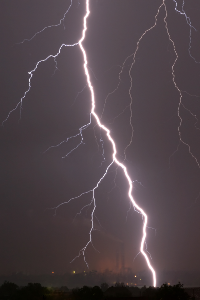 We looked at historical weather records and found that there had been lighting storms in the area on the date in question, so we prepared a report for the customer so that he could begin a claim on his buildings insurance. The insurer was very good and approved the claim. We therefore replaced the faulty parts of the system. Properties fitted with solar panels are at no increased risk of lightning damage, but there are a couple of lessons here for those with solar panels on their roof. Firstly, it is paramount that the insurer is notified that solar panels are fitted to the house, as they are considered a material change to the property. Secondly, without system monitoring this client would have been unaware of the reduction in yields. Many installers do not provide monitors. We recommend that all systems have either a display or an on-line monitor. We were recently called out to investigate an intermittent fault on a solar PV system in Hoghton, Preston. Again, the original installer is no longer trading. The SMA Sunnyboy inverter was periodically reporting a supply error and shutting itself down. The customer had witnessed this happening but of course, when we attended it was behaving perfectly! We connected the inverter to a laptop and interrogated its error log. The fault was listed many times, dating back to when the system was installed over two years previously. The inverter was reporting a high mains voltage. The voltage at the mains, although on the high side, wasn’t excessive so we looked deeper into the inverter’s settings. It was found that the original installer had set the country grid standard incorrectly. It should have been set for G83/1, which was the UK’s grid standard at the time of installation, but instead it was set to the German grid standard. Changing the grid standard has to be done by an approved installer using a special password. We set the grid standard to the UK setting and checked the other settings. We found that there was some new firmware available for the inverter which can improve its efficiency so we also uploaded that. All done and dusted in one visit, with a software upgrade thrown in too – outstanding value for money. We received an enquiry regarding a system not working in Singleton. The client reported that his system was not producing any electricity at all. A faulty inverter was quickly diagnosed. The SMA Sunnyboy inverter was still within its warranty period so we raised a warranty claim with the manufacturer. A new unit was dispatched to us the day after and we returned to install it. During the visit a full inspection and test of the electrical side of the system was carried out and we also found that the supply to the inverter had been connected before the customer’s electricity meter rather than after it. This meant that although the customer was being paid for generating and exporting electricity, the system had not been slowing down (or stopping) his electricity meter, so his actual savings in the three years that his solar panels had been fitted had amounted to nothing. We estimated that this had cost him around £500 in lost savings. We carried out the necessary remedial work there and then. The customer was kind enough to leave a review on our Testimonials page. We had a call from a client who said that his SolarEdge system was not performing properly. On arrival it was found that the original installer had not even connected the inverter to the internet, so for three years the owner had been missing out on the excellent monitoring provided by SolarEdge. The inverter is in the garage so it would be impossible to directly connect it to the broadband router. As the inverter is an earlier model that doesn’t accept a Wi-Fi upgrade kit, we installed a wireless range extender in the garage and connected the inverter to that. Secondly, we found that the inverter was only communicating with eight of the ten optimisers. There was no record of the locations of the optimisers so we had to get on the roof to map the layout. We found that the optimisers were not secured properly and were resting on the roof tiles. This may have led to the premature failure of two of them. We replaced the defective optimisers from stock and secured the remainder to the rails. The result: a happy customer and a SolarEdge system working as it should. SolarEdge is great kit, but it is only as good as the lowest common denominator, i.e. the muppet that fitted it! This customer noticed that his PV system wasn’t generating, so he tried to contact his original installer. Same old story, they’re no longer trading, so a quick Google search brought us to his attention. His Power-One inverter was displaying error code E031. We verified that the solar panels were working correctly and checked the mains to the inverter. As the inverter was still under warranty we started a claim with ABB Power One for a replacement inverter. Unfortunately, at the time of writing (May 2015) the waiting time for a replacement inverter from ABB Power One was six to eight weeks. As the customer was on the original Feed in Tariff rate which pays almost 50p per unit generated, the customer took the pragmatic decision to purchase a replacement inverter from us so that he can be back up and running. He has kept the warranty replacement as a backup in case of future failures. Note that we do repair ABB inverters with E031 faults – Click here for further information. We had quoted for this installation back in July 2011, but the client had opted to accept one of his alternative quotes. He phoned us in May 2015 to investigate his PV system not working, having found that his installer had ceased trading. We diagnosed a faulty grid relay on his Eversolar TL2000 inverter, which is not uncommon on these models. Unfortunately, SMA acquired a majority shareholding of Eversolar in 2012, rebranding the company as Zeversolar. Shortly after this they moved their support from the UK to Germany, and whilst their warranties are still valid, replacement inverters are very slow to arrive. We made the client aware of the inevitability of a three month wait for a replacement inverter, and he opted instead to purchase a compatible replacement from us. He took us up on our suggestion of a Solis 2.0 mini inverter and we got his system up and running the following day.